When you get into the exciting game of disc golf, you begin to learn that there are many different aspects and components to disc golf throws than what you likely learned when you started tossing a Frisbee around with friends. While the core elements are the same, the similarities end there. Trying to compare the basic Frisbee throw to a disc golf throw would be akin to comparing a blacktop parking lot where many kids learn to play to a disc golf course, with all of its challenges and obstacles. A proper throw in disc golf encompasses the grip that you choose, the stance, your windup, and release. It also can be affected by external factors such as the wind or rain or even pressure that you feel in the moment of the actual throw. In order to play the game of disc golf, you don’t need to have much more than a disc and the desire to participate. On any given disc golf course, you will see a variety of different players all with different skill sets and levels. It’s important that you don’t become frustrated by your throws, or try to compare yourself to anyone else. Focus first on getting the feel for the game and the rules, as well as scoring. As you become more comfortable, then you can begin to think about proper technique, such as the grip, stance, windup, and release. What Grip is Proper in Disc Golf? Dictating to someone the proper grip is like telling them how to hold a pen. While there are accepted grip positions, there is no true ‘right’ one for everyone. One disc golfer may find that he uses a loose grip better than someone who uses a tighter grip, just for example. The first thing to keep in mind with regard to your grip is that orientation of the disc in alignment with your arm is important. The disc should end up being like an extension of your arm. If you draw a line through the length of the disc, it should match up evenly to form one long line with that running down your arm. A golfer who holds the disc angling upward, for example, would be gripping it incorrectly. Next, the disc should be held in the seam of the hand. To find the seam, draw a line from the point between your index and middle finger to the center of your wrist. This is the seam in which the axis of the disc should lay against. The wrist should be angled downward, which will allow the line running through the axis of the disc to align with your arm. Keeping a straight wrist will move the disc into the wrong position. From here, place the thumb on top of the disc in a position that is comfortable. Maneuver your fingers into a comfortable position underneath. The index should place pressure on the upper edge of the disc while the middle and third fingers place pressure along the lip of the disc. When preparing to throw a disc, stance is important, depending on the type of throw you are attempting. However, whether you stand still for putts or use a running start for momentum in an effort to gain more distance for those longer shots, the point of release is where your stance matters the most. Keeping a balanced postured at the point of release is essential to a quality throw. The way to gain good balance is the ensure that your feet are spaced properly apart, generally about shoulder width apart. The lower you become to the ground, the more balanced you become. For this, simply bend slightly at your knees in a shallow crouch. When you have a balanced stance, you will be able to generate more power through your legs and that power will be transferred to the disc upon release. 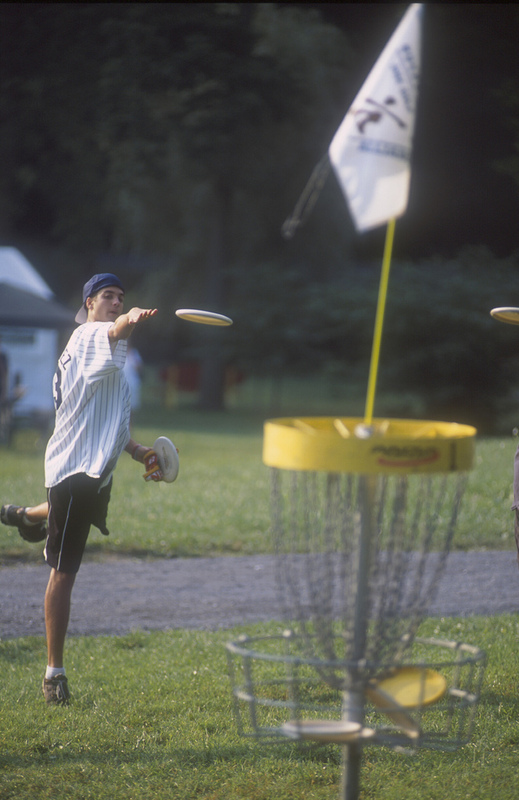 Some disc golfers prefer to use a straddling stance in which you face your target with your feet parallel and facing forward. This stance is most ideal for backhand throws in which you begin with the disc (if you are right handed) to your left side, moving it forward and releasing when your arm is fully extended. Another popular stance is the foot-forward stance. This doesn’t offer the same balance as the straddle, but is ideal for shorter putts. The side-straddle is the same as the straddle stance, but the difference is that the toes of your feet will form a line to the target. This is common in many sports where aim is important. Regular golfers use this stance almost exclusively for their main shots. Many people might think that the windup is just for show or that it doesn’t serve a great purpose. However, the windup is essential to a positive outcome. When you have the right windup, the entire throw evolves from it. If you rush your windup or treat it in a hackneyed manner, something like an afterthought, then consistency will become a major issue for your game. Whether you throw backhanded or forehanded, righty or lefty, your windup should essentially be the same for each of your throws. Putting is different and you may find that your putting windup will be different. The windup should be calculated, slow, and methodical. Never snap the disc back as this causes looseness in the control. When you don’t have full control of the disc throughout the throw, then there will be imperfections upon release. When this happens, your throw could end up far off the mark, depending on where your target was and the grievousness of the error. Get in the habit of using the same approach to each shot and you will begin to develop a consistent and formidable windup. 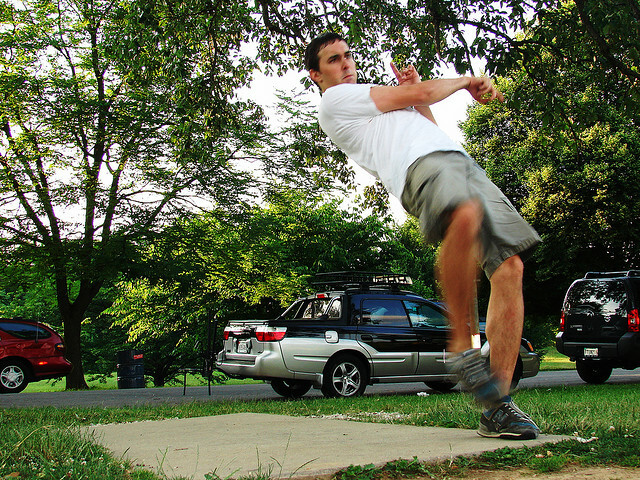 Perhaps the most difficult aspect of the disc golf throw to master is the release. This is the point at which all of the effort that you’ve put into the throw, from planning the trajectory and angle to the setup and focus, comes together. If your release is off even a slight amount, then that could equate to dozens of yards, and even more, off target. A shot that you intend to travel 200 feet, for example, through a copse of trees forty yards wide could actually travel 100 feet into the trees, fifty yards to the right of your target. The ideal release occurs at the moment when your arm is fully extended, your weight is off your legs and moving forward, and your fingers extended. The best way to practice your release is to face a wall or a net with a target on it, standing only ten or fifteen feet away, and, using the proper stance for the type of throw you are working on, try to hit the target with the same release point. A release point on your forehand side may differ from that on your backhand side. Releasing too early will keep you from capitalizing on the full power potential. Releasing to late will push the disc far off target. A late release also has the potential to become caught on your fingers, snapping it down, driving it into the ground just a few feet ahead of you. When you put the components of the throw together, you will find that your throws become more consistent and you spend less time trying to work around hazards and obstacles and more time putting for the finish. Creative Commons Flickr Photo courtesy of Lehigh Valley, PA.